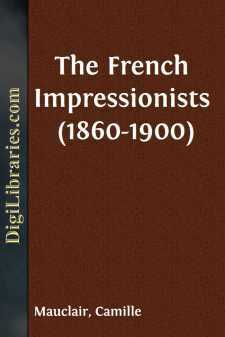 It will be beyond the scope of this volume to give a complete history of French Impressionism, and to include all the attractive details to which it might lead, as regards the movement itself and the very curious epoch during which its evolution has taken place. The proportions of this book confine its aim to the clearest possible summing up for the British reader of the ideas, the personalities and the works of a considerable group of artists who, for various reasons, have remained but little known and who have only too frequently been gravely misjudged. These reasons are very obvious: first, the Impressionists have been unable to make a show at the Salons, partly because the jury refused them admission, partly because they held aloof of their own free will. They have, with very rare exceptions, exhibited at special minor galleries, where they become known to a very restricted public. Ever attacked, and poor until the last few years, they enjoyed none of the benefits of publicity and sham glory. It is only quite recently that the admission of the incomplete and badly arranged Caillebotte collection to the Luxembourg Gallery has enabled the public to form a summary idea of Impressionism. To conclude the enumeration of the obstacles, it must be added that there are hardly any photographs of Impressionist works in the market. As it is, photography is but a poor translation of these canvases devoted to the study of the play of light; but even this very feeble means of distribution has been withheld from them! Exhibited at some galleries, gathered principally by Durand-Ruel, sold directly to art-lovers—foreigners mostly—these large series of works have practically remained unknown to the French public. All the public heard was the reproaches and sarcastic comments of the opponents, and they never became aware that in the midst of modern life the greatest, the richest movement was in progress, which the French school had known since the days of Romanticism. Impressionism has been made known to them principally by the controversies and by the fruitful consequences of this movement for the illustration and study of contemporary life. I do not profess to give here a detailed and complete history of Impressionism, for which several volumes like the present one would be required. I shall only try to compile an ensemble of concise and very precise notions and statements bearing upon this vast subject. It will be my special object to try and prove that Impressionism is neither an isolated manifestation, nor a violent denial of the French traditions, but nothing more or less than a logical return to the very spirit of these traditions, contrary to the theories upheld by its detractors. It is for this reason that I have made use of the first chapter to say a few words on the precursors of this movement.